Wigan midfielder Tim Chow says two weeks before scoring on his full debut, he was told he would be released in the summer. The 21-year-old came on as a substitute against Millwall on 14 April and four days later scored after starting against Brighton. 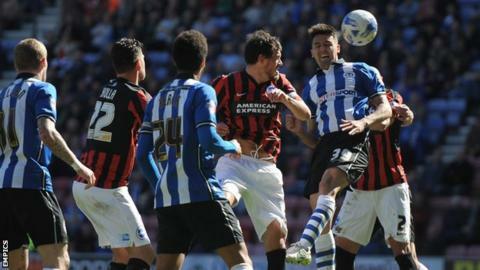 Wigan-born Chow has been given his chance since Gary Caldwell replaced Malky Mackay as manager on 7 April. "Two weeks ago I got told I wasn't getting another contract," Chow said. Speaking to BBC Radio Manchester, he added: "Full credit to the manager, he's come in and straight away he's told me that I've got a future at this club. "All I wanted was a chance and the gaffer has come in and he's given me that." Despite the three points against Brighton, Wigan could still need to win their final two games of the season, starting with Wolves on Saturday. But that situation is subject to change as Rotherham are currently facing a possible points deduction for fielding an ineligible player. "It's been a hard season to watch, so to finally get on the pitch and make a difference is a dream come true," Chow said. "I've been at this football club since I was 10 years old. This is my club. "I had a few other options and I was basically looking at a new club for the summer, but it's a funny old game, isn't it?"